When I get stymied over something to write about one of my first activities is a visit to the weird news sites. They usually don't fail to inspire me. Well, maybe inspire isn't exactly the right word. I mean who are we kidding? We're not doing Ernest Hemingway here are we. Faulkner, maybe. Gotcha! Ready? I gotta say it took some time for the 3 Bears to get their revenge on Goldilocks but after all these years they finally came through. Of course Goldilocks only ate porridge and napped in their beds. For bears revenge is a dish best served bold. If you're going to Norway you may want to think twice before you rent a cabin. A family that did came home to quite the surprise upon their return. Seems a family of four bruins broke into their abode and partied on dude. Did you know a group of bears was called a "sleuth"? Seems appropriate since these guys sussed out bear party central. Yep, the four gorged themselves on all the food in the cabin including chocolate, marshmallows and honey. What is that the bear version of smores? They then found and drank over 100 beers. That's got me and Whitey beat, even on a good day! After their paws that refreshes they proceeded to trash the place. Talk about animal house (food fight!) literally. We could learn from our four-footed friends. I mean these guys are the original party animals, don't ya think? 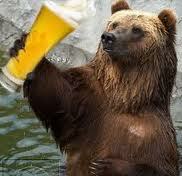 Of course it's too late to do anything about this big bear beer fest. I guess the owner will just have to grin and bear it. I'd rather you show up with beers and not bears. You can leave those guys behind. Do you think they woke up with hangovers? Or do they figure they can sleep it off this winter? I live in "bear country" and they are relentless when they want something. They break into our padlocked shed consistently during Spring. it's where we keep our garbage. If we had a garage we'd stow it there but we do not. The beer guzzling is hilarious. Imagine the mess they left behind. Ha, ha. Very good P.J. I'll bet when bears sleep it off the really sleep it off. We live near the country and get deers, foxes and the odd coyote. Thank god we don't get bears. But I'm keeping my garbage in the garage just in case. I'm also a fan of the weird news sites when I've got nothing to write about. Great material! Some of the news is hard to believe, like toilets exploding on trains and a dead man mistaken for a Halloween dummy. Yikes! I didn't know that bears drank like fish. Slap on a sheet and you've got a toga party but then they wouldn't be bare. You're a funny lady! Par-tay! : ) I should stay off my ADD meds more often. For sure, yeah. Look a squirrel. Seriously, don't fool around with your meds. Take as directed, as they say. Might be bad, though. Imagine a bender like that and going to hibernate. What happens when you have to take a leak? Well, I don't know about you but I couldn't bear it.